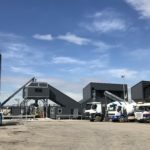 Aggregate Industries has opened a new, high-capacity ready mix concrete plant on the outskirts of Sheffield. The new site – located just off the Europa Link, Tinsley – sits beside the established Aggregate Industries asphalt plant and is accessible via Junction 33 of the M1. It is able to produce 130m3 of concrete per hour from its 3.3m twin-shaft mixer; nearly 10 times the rate of the previous Aggregate Industries Sheffield site on Warren Street.